Lots of clear drawings. Short and simple explanations. Good to flip through and find pertinent info to you (whatever you’re interested in doing in your area in whatever activity you enjoy). For instance, I will not make an ice raft in Washington and I don’t need to know about mountain biking or tigers. I was interested in dealing with tent leaks (p 48) and glanced over the basics of choosing a campsite. Gives you a lot of info about different types of things (sleep bag construction such as offset quilt and slant box baffle) to give you a starting point for researching gear or concepts (such as navigation or weather). Great to get at the library or borrow from a friend and take a few notes on the book, rather than buy it. They don’t go into a lot of eco-friendly detail. For example, they have soap listed a couple times (for washing yourself and your dishes) but they couldn’t have said biodegradable soap without taking up much more room on the page. But it’s just a starting point. 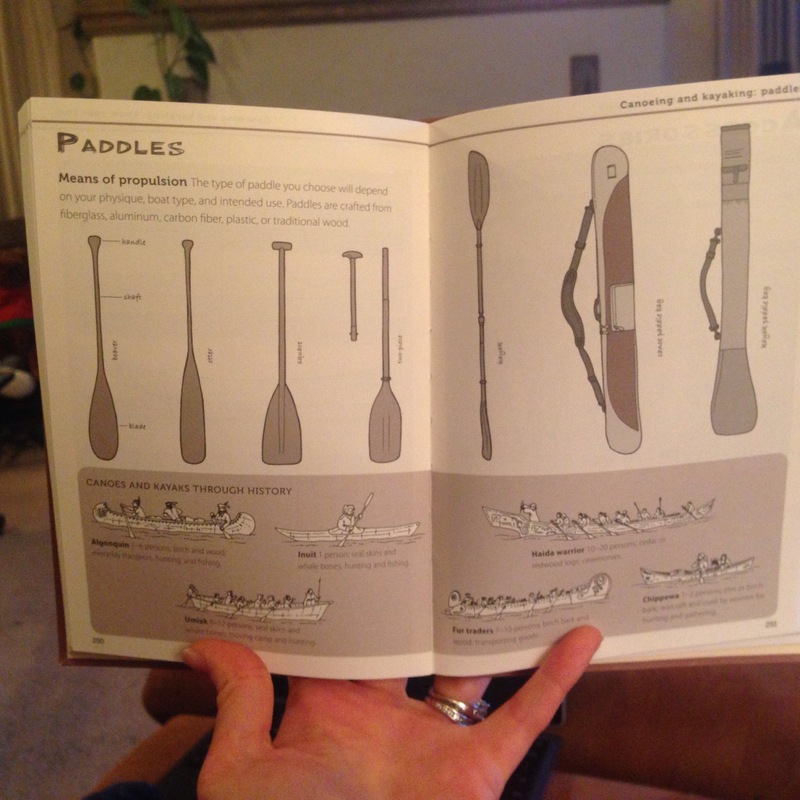 There’s a few fun super brief pieces of history, such as knives (p. 60) and canoes/kayaks (p. 250-251). The most interesting part to me was not the canoe and kayaking section (it’s too basic at this point) but actually the weather section. Between the short snippets (starting with why there are changes in pressure and including sea breezes) and clear drawings I learned a lot from the overview. A few times I’ve started to briefly research weather information and have quickly gotten lost in jargon and too in-depth explanations. I just want the gist at this point, to give me structure on what to learn later, and this book provided that for me. 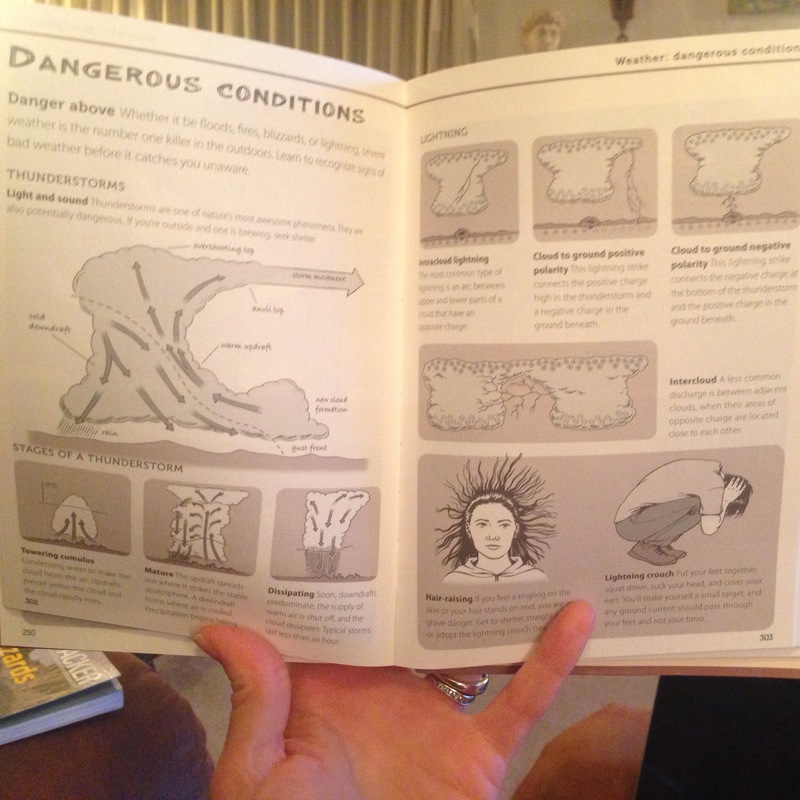 Backpacker Outdoor Hazards: Avoiding Trouble in the Backcountry (a Falcon Guide, 2012). 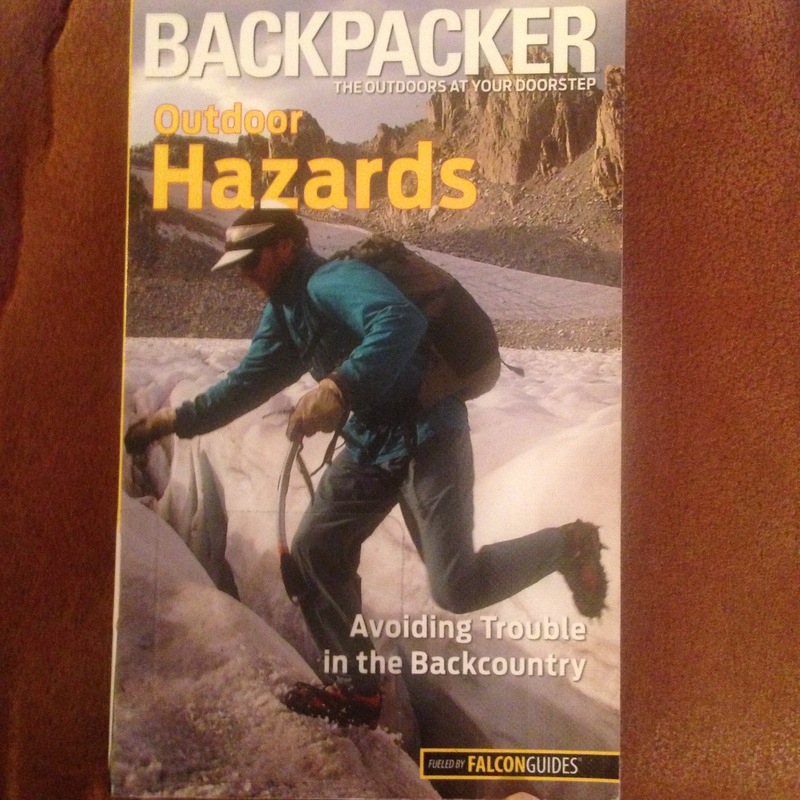 The book begins with differentiating between objective and subjective hazards, That is, hazards in the wilderness that you can only prepare for (because it is the wilderness after all) and hazards that you can prevent entirely because they’re from not knowing what you’re doing. The book addresses both. I’ve run into both types of hazards. One person showed up to a two day backpacking trip in Alaska with only a hiking chair on his back; a subjective hazard. Not preventable, but an objective hazard, we’ve run into lightening storms kayaking. The more information we have the more we can keep stupid things from happening and deal with what does happen. After all, you can’t avoid every safety issue, you’re in the wild! That’s the fun of it! Overall it covers the topics of dealing with temperature, precipitation, wind, lightening, natural disasters, steep terrain, water, and living things (including snakes, spiders, mosquitos, bacteria, bears, plants, people, and more). Why read a backpacking book? 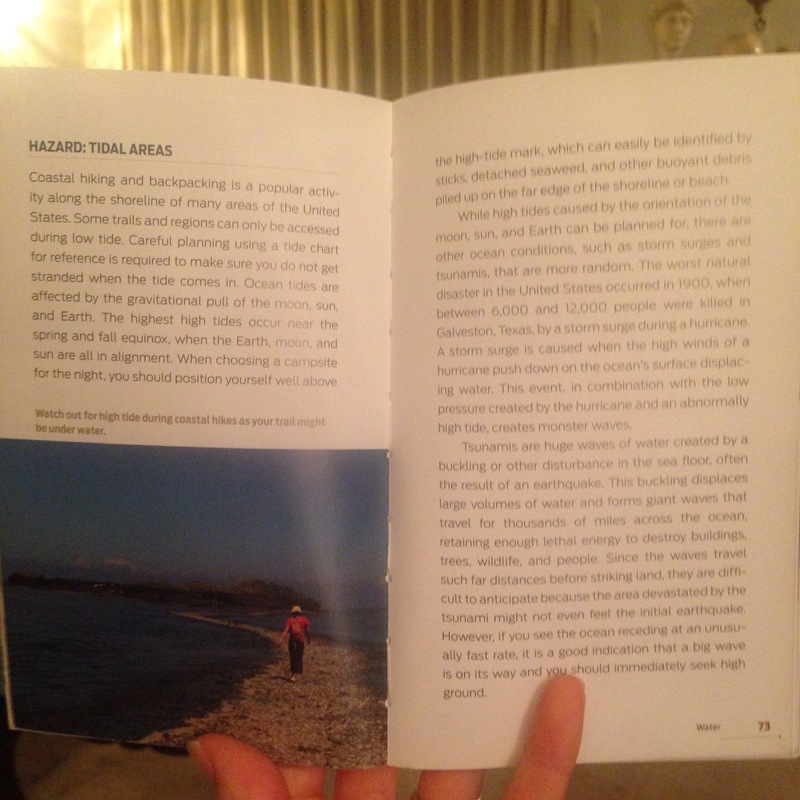 Most kayak books deal with technique and navigation and kayaking skills. But when you kayak camp you’re in the wilderness in the same way as a backpacker… you have to rely on what you’ve got in your hatches and the knowledge you already have in your head. Plus, you may paddle all morning but if you make camp with enough daylight left to go hiking you’ll want to know information for that activity too, so you’re not limited to beachside fun. Or you can mix the two and hike with your kayak to access a lake not accessible by road in the U.S. like we did but I don’t recommend it. I like black and white numbers (not to follow them cut and dry but to give me a place to start) so I appreciated learning faces like while doing hard hiking all day (or paddling perhaps?) we need about 135-270 calories of carbohydrates per hour. Have complex carbs by day and fats and proteins by night (which will also make you warmer) (p. 5). I also like the tip to have your tent door facing the wind (p. 35 – update: it sounds interesting but I’m not going to try it until I figure out why/if it’s actually good advice) and prime lightening time is noon or later (p. 38). This book is easy to read (and a quick read at 116 small pages with frequent color pictures and bullet points to summarize the important information. It’s good about introducing terminology so you can use your new vocabulary while reading further into the topic in a more advanced book. I will not say this is a must read (though knowing how to prevent and deal with hazards is a must!) 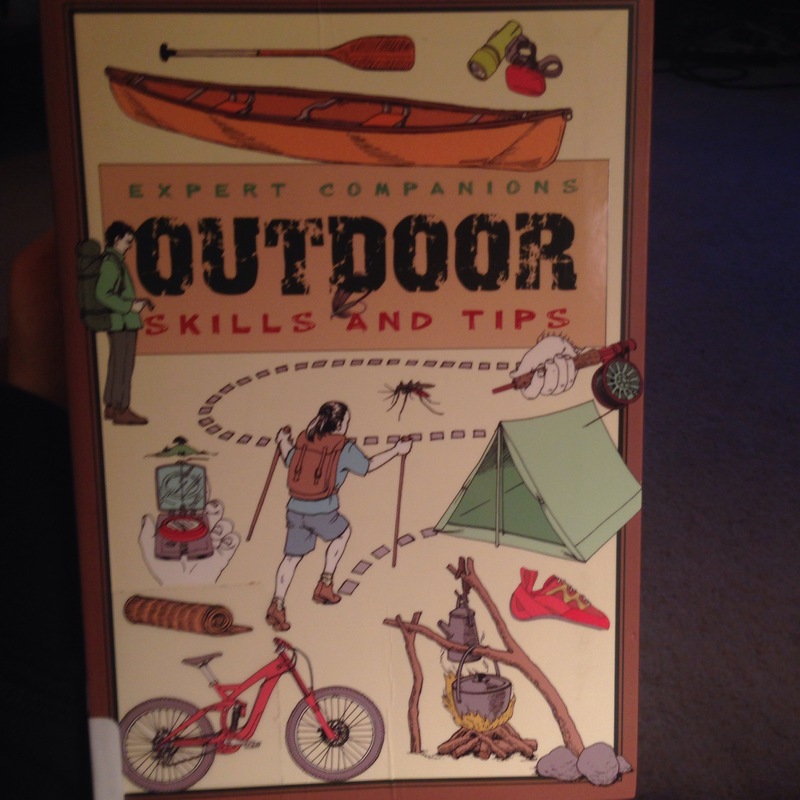 but I’ll recommend you read this book before adventuring if you want to learn more about preparing for and dealing with the elements if you kayak camp in more remote areas, or if you want to get more into hiking/backpacking and haven’t done a whole lot of it or want to push yourself more (like you want to hike up a rocky hillside but don’t have the skills to decide if that’s a good idea and what the safest way would be). If you’re kayaking/backpacking in Alaska though I’d recommend reading other books… the information regarding moose, bear, and wolves is not the most comprehensive. Backpacking is how I got into kayaking. In Colorado, the snow/ice doesn’t melt off the high-country lakes until the middle of June sometimes and I wanted to find a way to use all of our backpacking gear in late May and early June. Kayaking was a perfect fit. I often tell people that 3-4 day kayaking river trips is backpacking without all the work. I am curious about the tent door facing into the wind. What’s the reason for that? On a frog-style backpacking tent I prefer to put the foot end toward the wind. With the wind, in with you! I think it would make sense to put your tent door opposite the wind… That book didn’t have descriptions, but I’d definitely not try putting it into the wind before finding a better explanation. I agree with you. Where you kayak, it looks like plenty of work, However, kayaking rivers, where the current is helping, like on the Gunnison, Yampa, Colorado and North Platte, it’s a bit easier than hiking in the mountains with a 45 pound pack on your back, starting at 9,000 feet and camping at 11,500 feet. It’s all good fitness and enjoyable. It’s too bad the author didn’t explain the reason for the tent door into the wind. Oh, well. Figured I’d ask. Thanks. It’s Maureen from DelightPress, Taiwan. And your review of this title is really useful to us. May I put your review on our book flap? There’s a few fun super brief pieces of history, such as knives and canoes/kayaks. A few times I’ve started to briefly research weather information and have quickly gotten lost in jargon and too in-depth explanations. I just want the gist at this point, to give me structure on what to learn later, and this book provided that for me. Many thanks and look forward to hearing from you soon.